We set the GPS (his name is Rooter) onto Touring Cycle mode which takes us off the beaten track so we can experience quieter roads and small villages instead of tailgating drivers, speeding trucks with massive loads of sugar beet and larger town centres. Every plan has its pitfalls. On the Sunday we were looking forward to packing up camp and heading into the next village to find the daily freshly baked baguette for breakfast. We cycled through eight villages and not only did we fail to find a baguette but we failed to find any food at all. We learned the hard way that nothing is open on a Sunday except the local Tabak. So we had a beer. Bearing in mind that French roads are very good and we feel very spoilt, there was an episode which Shannon will appreciate where we went ‘ry reg deur my beeste’. 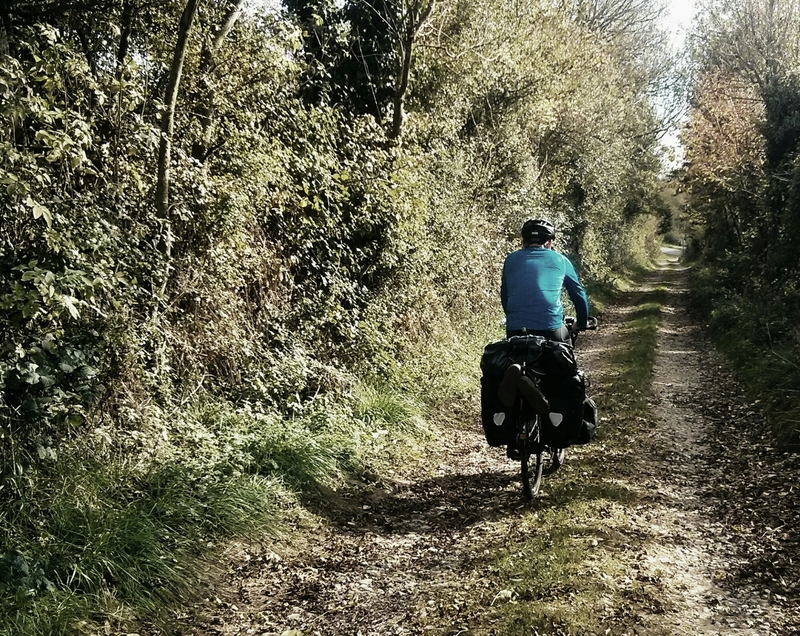 Rooter decided to cut a corner, took us on a muddy, flint surfaced steep downhill and almost took us straight through the local farmer’s milking herd, hard braking all along. All that when we could have enjoyed a speedy downhill section of fine French tarmac. But there are the benefits too. Being off the beaten track, we were able to wild camp in forests for four nights running without any qualm. We experienced a day of unexpected highlights. Cycling past a farm we noticed a line of cars parked and a bunch of locals picking up the leftover carrots from the harvester. We joined in and dug up about two kilos of carrots. A little further there was a field with some leftover potatoes. That gave us the fresh produce for our potjie. We still hadn’t found a baguette for a day and a half. It was Monday lunchtime and were digging deep into our rations having eaten couscous for lunch and dinner the previous day. A passing cyclist, Cycle Fred, who spoke great English offered to lead us to the next town where we would find a well hidden supermarket. The only challenge was trying to keep up with him with our heavily laden bikes into a strong headwind. 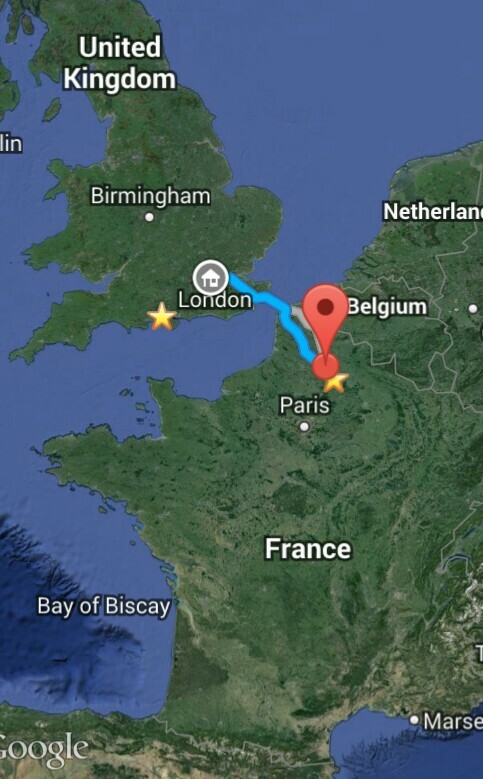 We covered some decent mileage in very little time and finally got our baguette. 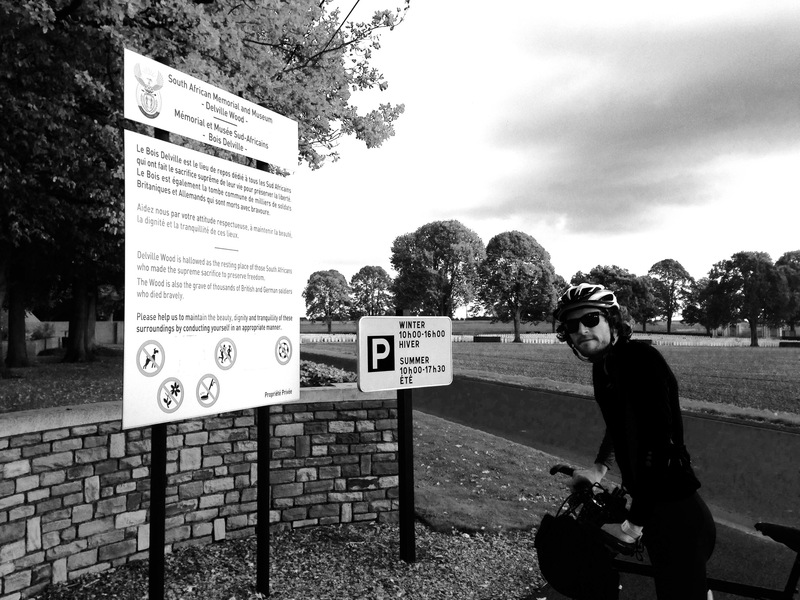 Cycle Fred also let us know where to find tap water in every cemetery. Thanks Cycle Fred for the tips. I washed the carrots and potatoes in a cemetery. We were invited into a random home for tea and cake that afternoon. 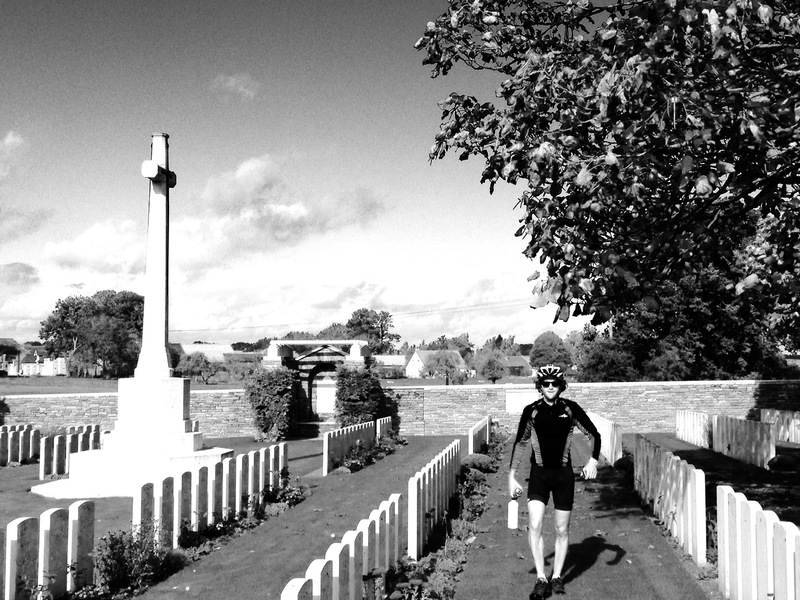 A very friendly Hunter Russell (he had a French name but he was nuts about hunting and his Jack Russell marked his territory all over John’s bike) explained to us that we were riding along the Western Front, hence all the graveyards. We rode on and spotted a pristine, finely manicured forest. A perfect place to camp if we could find a spot to penetrate. It was protected by a South African proof fence and we had no chance. This fenced area went on for quite a few miles. It turns out that this forest is Delville Wood and a museum and memorial to the South Africans killed in World War One. What are the chances. Even some of the Oak trees are imported South African Oak. We had a good day and cycled 72km, crossed our first provincial border and the River Somme. 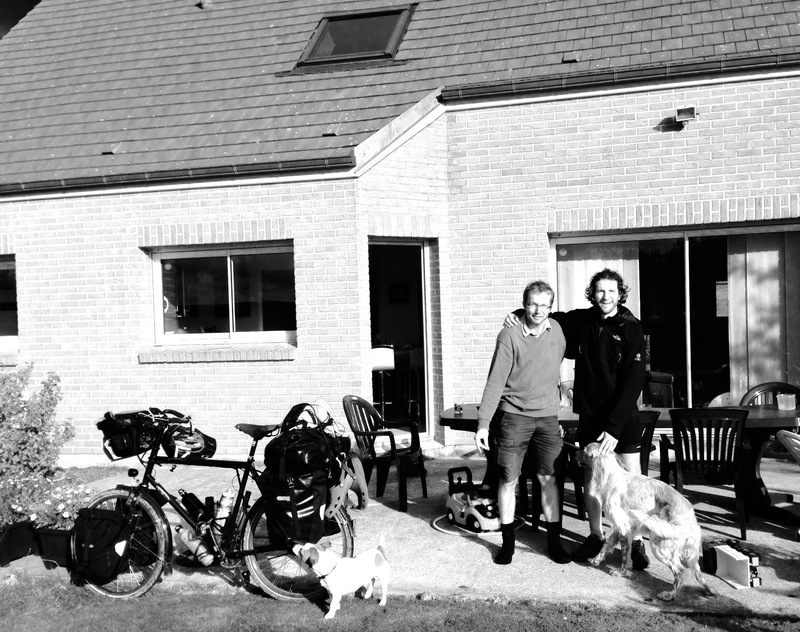 Battery power was low and we were and in desperate need of laundry after 8 days on the road so we headed into Péronne. loving your blog, it is really bringing your trip to life, we visited the war graves some years ago, quite something, keep peddling, take care! Laughing! Ry sommer reg deur my beeste!! Most memorable road we have ever been on John!!! Classic!